Spending quality time with grandparents is precious, I have a lot of memories that I took with me into my adult-hood after the trinkets and toys of yesterday have rusted. I, remember quite vividly some of the old tales from my father about one universal ethnic group in ancient times that; all human beings spoke the same language, then they decided to build a tower to reach the heaven connected with the Almighty God. The construction goes smoothly in the first few days until they reached a certain level of advancement on their project, then God said; Human being is complex and disturbance. Along the way, God Almighty, for reasons only known to Him, created different languages ” tongues”, while folks were in the middle of excitement to finish their tower. Unfortunately, things didn’t go well, they couldn’t understand one another, because the communication process was broken, which caused a whole host of disagreements and confusion among them, eventually resulted in the cancellation of their task, and to the failure of the project. That was the beginning of the different tongues and languages in the world. The questions that I am asking the sixty-four tribes of South Sudan with are: what can we do to speak with one universal language again like the way it used to be?. You weigh in! I’m truly blessed to have the opportunity to witness the greatness of the generation of my father, who carried themselves with respect, dignity and honour. For example, I have never ever heard my dad saying any negative or incitement words about other community members. We were constantly reminded to respect anybody that’s older than you. Today, what some of us do is diligently poisoning the minds and hearts of our children with negative adjectives about other tribes, such as: ” Our tribe is better than the rest.”, “we are the warriors”, “we are the liberators, and those are traitors.” The list of negativity goes on and on. To this very moment, I remember one of my father best friend and colleague, who happened to be from Murle tribe uncle Ustaz David Arany. He was at Malakal Teaching Institute. I thought that uncle David was my blood relative until figured out some years later when I grew up and met his son, John David in Nasir Junior Secondary school. Also, I will never forget our neighbour Ustaz Nicodemous Arou, the father of the prestigious journalist Ustaz Majok Arou from greater Bor, and many more, just to mention only a few. Honestly speaking, we had lived like one big family. The good old days, were truly and really golden in every way. nevertheless, recently, I saw an ad of a kindle book that you can start reading anything on the new iPhone, apple, android phone, or blackberry etc…. accessing the information is about everything, and giving the universal access to a gold old book is another. It’s just like a review, survey, or contemplation of things in the past which we realize and say; “The old days will remain golden days “. Frankly speaking, now, what is going on in South Sudan is tragic. The mass killing of helpless civilians, and lost of properties between different ethnic groups, it’s obnoxious, disgusted and brutal, just to say the least. Truly, I lose sleep over it, and it’s a fire in my bones, escalating like a wildfire, and I can’t remain silent, something must be done to stop these atrocities. The golden phrase says; “prevention is better than cure”. 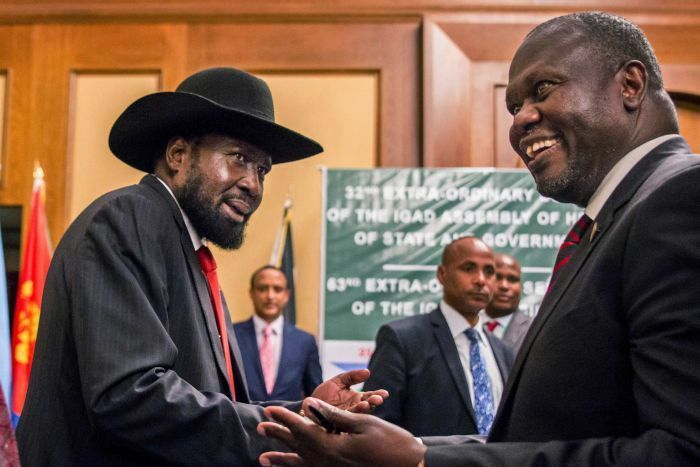 Compatriots, what I am trying to address here is to appeal to President H.E Salva Kiir Mayardit, the president of the Republic of South Sudan to implement a decentralization system, then, consider a random appointment of counties commissioners, heads of the states and public service personnel from across the Republic of South Sudan. Beyond a doubt, such policy will not only help in the reduction of tribal sensitivities, and rampant corruption that was happening today, but it can also subdue, and minimize the violence across the country. It’s time to go back to the old system that has proved to work diligently. fellow citizens, we cannot deny the simple truth that we were the ones who have been constantly shaping reality. But, another simple truth is that: it is not too late to change something. We can make this country a better place to live if we try. So, why not to create good instead of evil?. Why not make Peace instead of War?. Why not spread love and compassion instead of Hate and arrogance?. Can we all just say; enough is enough of these tribalism, sectarianism, nepotism, and corruption and just focus on the goals that will unite us as one nation? Can we turn around to the good old days in our lives?